There are dire reports of people waiting in supermarket lines all day, only to discover that expected food deliveries never arrived and the shelves are empty. There are horrific tales of desperate people slaughtering zoo animals to provide their only meal of the day. Even household pets are targeted as a much-needed source for food. President Maduro is doubling down on the proven failed policies and philosophies of “Bolivarian Socialism,” while diverting attention away from the crisis — pointing fingers at so-called “enemies” of Venezuela such as the United States, Saudi Arabia and others. A dozen eggs was last reported to cost $150, and the International Monetary Fund predicts that inflation in Venezuela will hit 720% this year. To the outrage of many in Venezuela, embattled President Nicolas Maduro on Sunday jokes about the shortages and hardship under his administration. “The Maduro diet. Makes you hard without needing any Viagra,” said Maduro Sunday, laughing, during an exchange with the audience. The “Maduro diet” is what Venezuelans call slow starvation due to economic dysfunction inflicted by the socialist government. Likewise, Americans would be placed on the Bernie Sanders diet and the British on the Jeremy Corbyn diet if leftists had their way. As it is, we progress by increments toward Venezuela’s condition by allowing the government to grow ever larger. 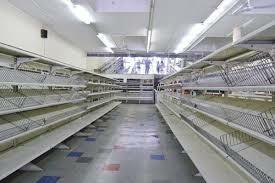 Shopping on the Maduro diet. On tips from Bodhisattva and Torcer. Cross-posted at Moonbattery.